The European Space Agency's Venus Express orbiter have has spotted many small-scale 'gravity' wave trains in the planet's clouds. The waves are mostly found at high northern latitudes, particularly above Venus' Ishtar Terra, a continent-sized region that includes the highest mountains on the planet. Image released Jan. 13, 2014. A European spacecraft circling Venus has captured high-resolution images of strange waves in the clouds whirring above Earth's nearest neighbor. These ripples could help scientists understand how Venus' hellish surface shapes its atmosphere. On Venus, mountains and volcanoes rise above vast lava plains and temperatures are hot enough to melt lead. But this hostile landscape is largely obscured by the planet's dense, toxic atmosphere with clouds blown by winds up to 186 to 248 mph (300 to 400 km/h). Scientists looking at Venus Express data confirmed that gravity waves in Venus' clouds are concentrated near the planet's high northern latitudes, especially above Ishtar Terra, one of two continental landmasses on Venus, which is about the size Australia. These patterns occur in the planet's uppermost clouds, some 37 to 43 miles (60 to 70 km) high. "We believe that these waves are at least partly associated with atmospheric flow over Ishtar Terra, an upland region which includes the highest mountains on Venus," researcher Silvia Tellmann of the University of Cologne said in a statement from ESA. "We don't yet fully understand how such topographic forcing can extend to high levels, but it seems likely to be one of the key processes for the generation of gravity waves at high northern latitudes on Venus. The waves may form when a stable air flow passes over the mountains." In 2012, Tellmann and a group of scientists first reported that they had detected gravity waves above Venus by using the Venus Express Radio Science Experiment to look at changes in the frequencies of the radio signals that passed through the planet's thick atmosphere. A study of gravity waves in the atmosphere of Venus found four types of waves: long (top left), medium (top center), short (top right) and irregular (bottom row). Identified in images obtained with the Venus Monitoring Camera aboard Venus Express, they were mostly found at the planet's high latitudes (60-80 degrees N). The new high-resolution images taken with the Visible Monitoring Camera (VMC) aboard Venus Express show gravity waves are indeed found over Venus' northern latitudes. In fact, the study researchers say the weird wave patterns were spotted in more than 300 images, taken over the course of 1,500 orbits of Venus, and they seem to take four different forms: long, medium, short and irregular. This plot of the cloud waves on Venus shows the gravity wave potential energy density for the altitude range 65 - 80 km as a function of east longitude and latitude. 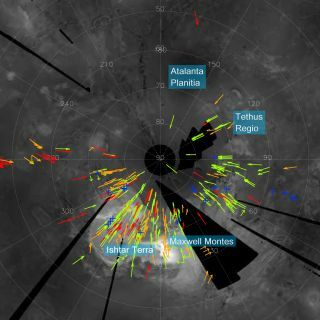 The plot is bsaed on data from Europe's Venus Express spacecraft and overlaid on an image from NASA's Magellan Venus probe. Håkan Svedhem, ESA's project scientist for Venus Express, said the new images help confirm that air flow over the uplands of Ishtar Terra produces gravity waves high above the planet. "This is an exciting result because it strengthens the case that topography is likely to be a significant influence on the atmospheric circulation of Venus," Svedhem explained in a statement. "This influence has been predicted by models but never observed in such detail until now," Svedhem added. "Understanding the mechanisms of surface influence on atmospheric processes is crucial for understanding the maintenance of the remarkably rapid circulation of the atmosphere at Venus' cloud tops." The new research was detailed in the January 2014 issue of the journal Icarus.